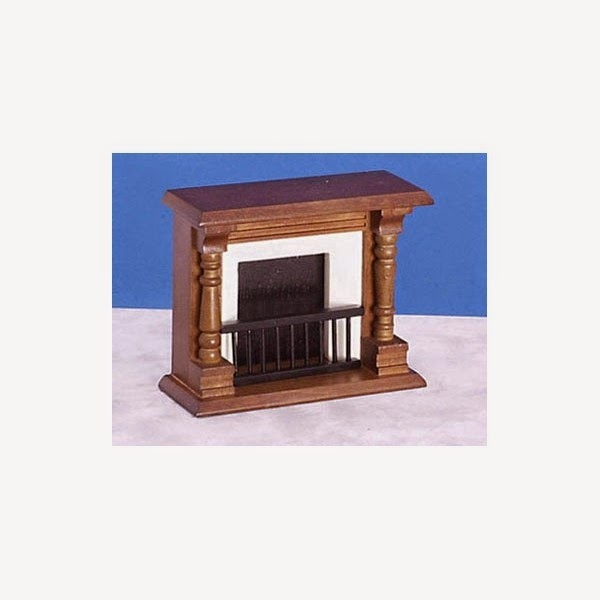 I had purchased some time ago a fireplace for the dollhouse. My only criteria was that it was cheap. Unfortunately cheap usually means ugly which then usually means that I will have to work on it to make it pretty. Me, not leave something alone? Shocking. I had purchased this ugly puppy from my most favourite store in the whole world, The Little Dollhouse Company. It was something around $11. Good enough. I took off the front rail. Ugly. I then primed it and painted it in "Romance" (the white), a black back and the silver trim. I then Mod Podged it in gloss finish, except for the black portion that I used matte finish. Why? Dunno. Just liked the look of it. 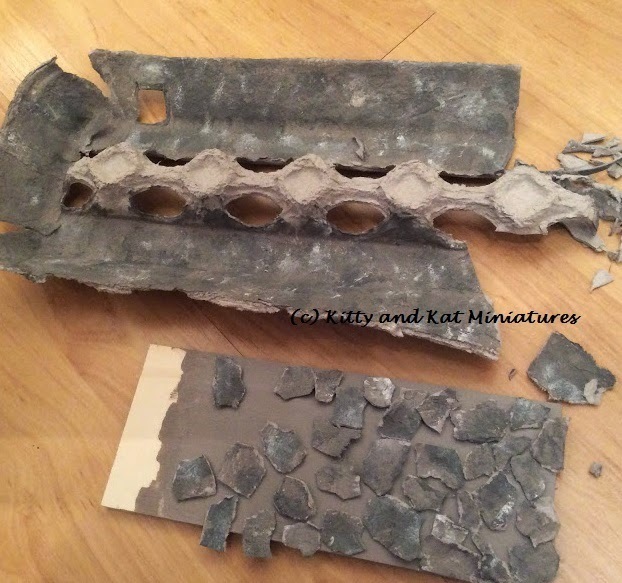 I stumbled upon the Victoria Miniland Egg Carton Stone Tutorial. Sold! I took a small chunk out of a sponge and went back to my 1990's crafting roots and sponge painted DecoArt "Antique White" and Martha Stewart "Lake Fog" and "Gray Wolf" on to my egg carton. I didn't do much ripping of the egg carton, I mostly used manicure scissors to hack at it. I made sure to have longer strips so I could wrap some over the edges to avoid weird seams from the sides and front. This is the rear view of the wood I used. I used 4 popsicle sticks as the edge pieces and the cut off ends to shore the sides up. 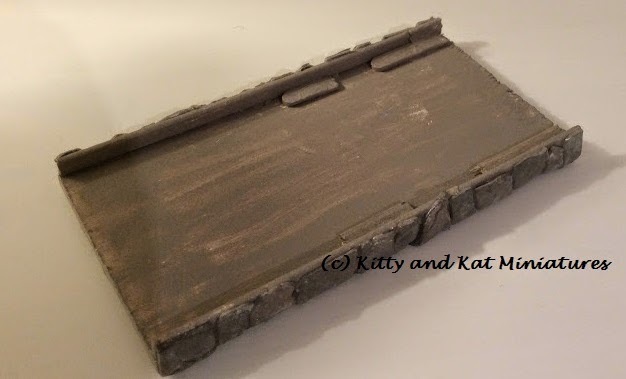 I base painted the wood in "Gray Wolf" because I knew that I wasn't going to do the grouting step for this project. I applied the stones with Aleene's Tack Glue. A bit of a puzzle with wrapping the stones over the edges and making sure everything looked uniform. I then coated it with 4 coats of Mod Podge. I did extra coats because I wanted to fill in the "grout" spaces. 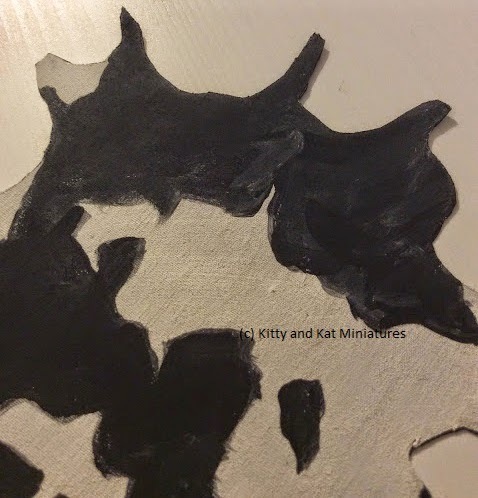 Between the "Gray Wolf" base and the Mod Podge I was happy. And it actually fit when I put it in the dollhouse! I was worried that even though I did a dry fit I would be over a hair and have to shave it. But, for once I measured correctly. 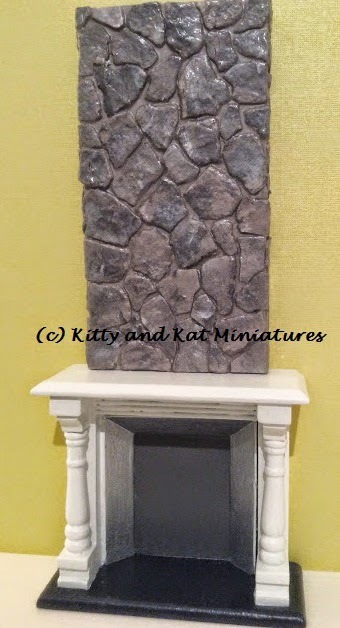 I installed both the fireplace and stone with Quick Grip. The art in the first picture was taken from the mini decks of scrapbook paper. I used matchsticks and popsicle sticks as frames and the clear plastic from everyday packaging as "glass." I even miter cut the frames. I have been incredibly busy the last two or so weeks! Even though I have all my pictures ready and projects underway, getting to write was always on the bottom of my list. I've almost finished the bathroom and I've started modifying my store bought kitchen cabinets. Miss Kitty mucks about in the furnace room as I dart in and out to apply clear coats on the cupboards. She's not terribly amused that I wont let her paint. 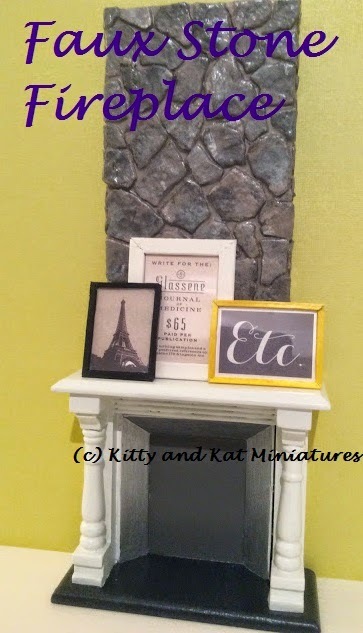 I decided to make a few permanent add-ins to the living room, the fireplace and the bookcase. I was all set with the wood on my table to start building a bookcase when my eyes wandered to the cupboard I had purchased from Michael's last year. The style was never going to work, but I knew I could use it for something. This was the perfect opportunity to save a bit of time and work with what I had. 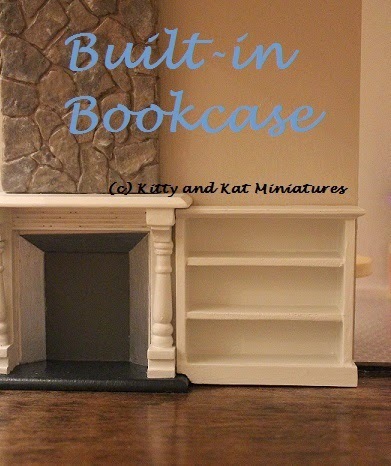 My own white built-in bookcases I built for my living room. I started with this bad boy from Michael's. Not very inspiring to look at. I ended up chopping it almost in half, popped out the doors and snapped out the shelves. Lots of sanding and wood filler to make it look good! I tossed on a new bottom shelf from some scrap wood I had once I figured out the height I was setting it at. I liked it just under the mantle. It butts up tight to the side of the fireplace behind the fireplaces front spindle. I then glued on little button feet to give it support. The feet were actually the perfect height. Had it not worked I would have used scrap wood. I then used a narrow popsicle stick as my baseboard. 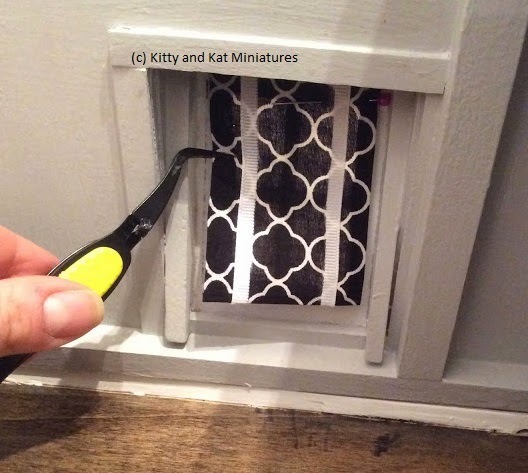 I used my lovely coping saw to make the board fit over the base of the fireplace. I then miter cut the other end and did the same for the piece of trim on the right side of the bookcase. I also used some scrap balsa wood to put in 2 shelves. Off to prime and paint! I used my left over CIL Smart Melamine finish paint in "Romance." Super durable for little ones to bash into. "Romance" is a lovely white with a hint of grey. It's everywhere in my house including my trim, kitchen cabinets and doors. There you have it! A little Quick Grip glue and its officially a built-in! 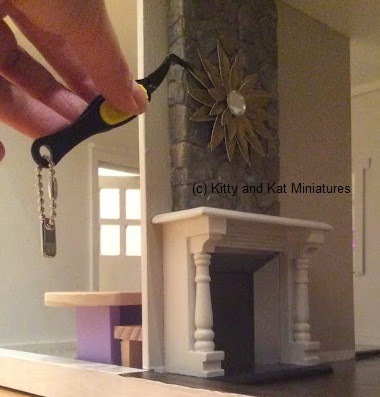 My first item to be permanently stuck in the dollhouse (I didn't glue the fireplace in prior just to make sure everything would fit). I was wandering HomeSense at 5pm with Kitty in tow. Just killing time before snack and bath time. They have such nice wall decor! Fast forward to a Pinterest moment a week later when I stumbled across the blog Sawdust and Embryos and their gorgeous DIY starburst mirror. A design moment struck! 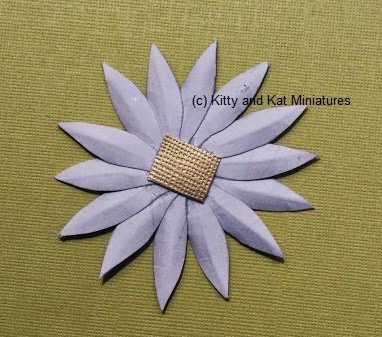 I thought, well, if they can make a full size version with cardstock, I can make a 1:12 version. 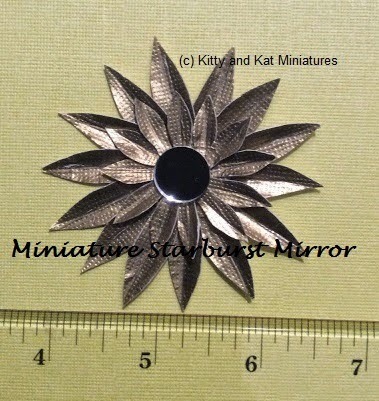 Beth at Sawdust and Embryos was kind enough to allow me to go ahead and make the mirror in miniature using her real life version as inspiration. Thanks Beth! I cut a 3/4 inch circle as my base to glue the leaves to. You need 14 large leaves and 12 small leaves. I wanted a mirror that was large enough for over my fireplace, but you can easily make this smaller, just cut your leaves smaller and cut a few extra. Run your finger name down the middle of the leaf to make a crease, this helps with the curve and makes it look leaf-like. 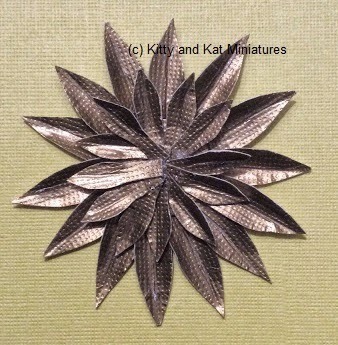 When I was finished gluing the large leaves to the circle, I flipped it over and placed a small rectangle of paper on the center point. This covers the center to ensure all the leaves are secured and provides a safe place to adhere your wall mounting adhesive when you place it on a wall. Flip it back over and adhere the small leaves to the front of the circle. Try not to make a massive hump of tails in the center, as you might need to trim some tails before you adhere them. 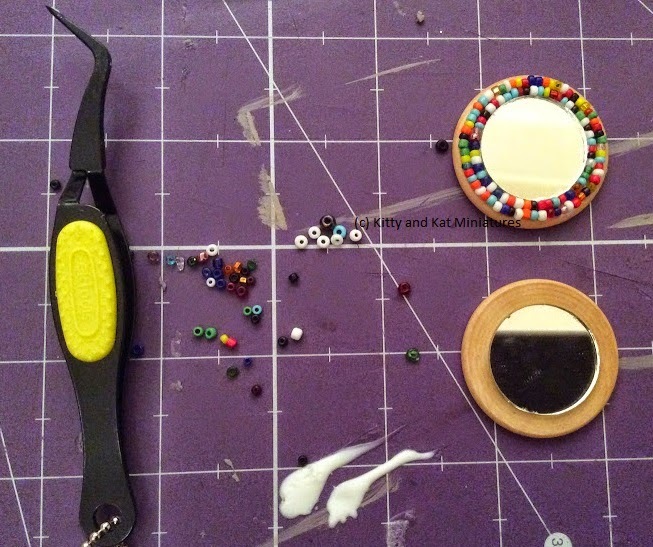 I then adhered the small mirror over top the center of the mirror. And there you have it! The mirror over my fireplace! What fireplace? 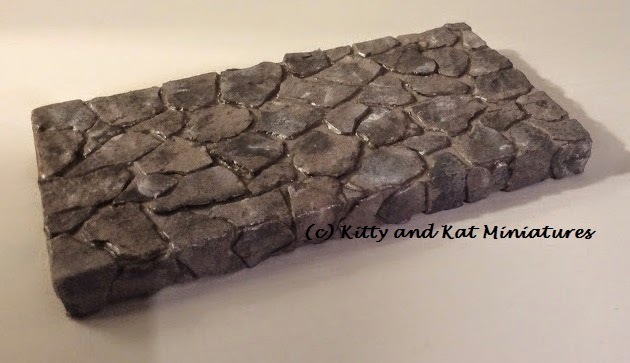 What faux stone? When did that happen???? I told you I am slow getting things posted. The work is progressing but I just fall behind with the photos! 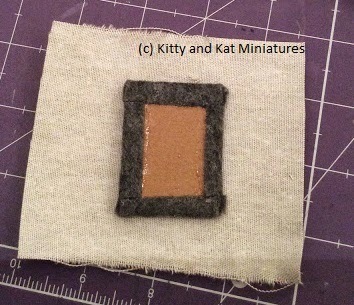 I will share the first permanently adhered into the dollhouse project soon. When Kitty goes to bed, I rush downstairs to my crafting and construction layer and get busy flexing my mental muscle. Not that diapers and playing doesn't stimulate me enough, but something for me is also nice. I decided I needed to paint, Looked at my furniture box and decided that tackling faux marble counters wasn't in the cards. 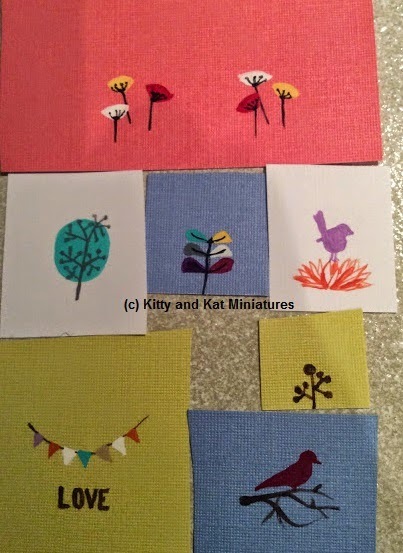 Instead, I took out some cardstock and my paints and got busy making miniature paintings. I took inspiration from 1950s and 1960s modern art and whatever doodles popped into my mind. Now to frame them. That little mitre box is such a pain in the *%#. Finally! I get the computer to myself. I've been busy the last little bit working away on living room furniture and now the bathroom. I also finally shamed myself into getting out the big girl camera, my Canon Rebel and taking real pictures, rather then the iPad. But I have a plethora of items that I have finished and taken pictures of, so back to writing! And soon I will post pictures of the house as its taking shape. I think its time to remove the farm animals Kitty has living there. I think the pig is using the bedroom as a toilet. 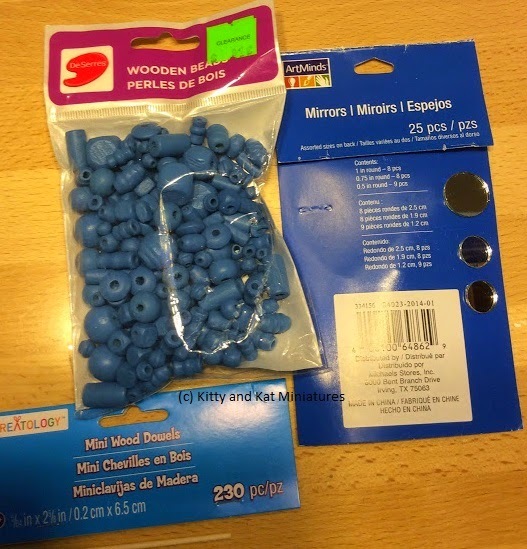 The haul was a random assortment of sale items from DeSerres (art supply store) and craft items from Walmart. 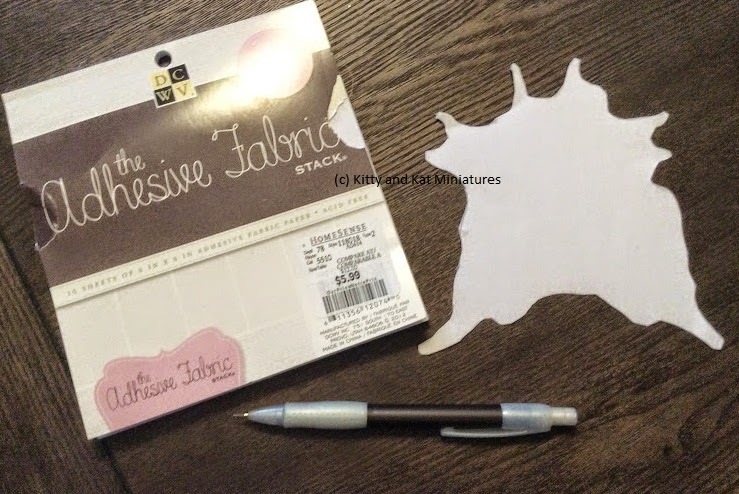 The scrapbook papers was from the mini paper decks which I bought clearance at HomeSense. I decided to make all the lamps at once. 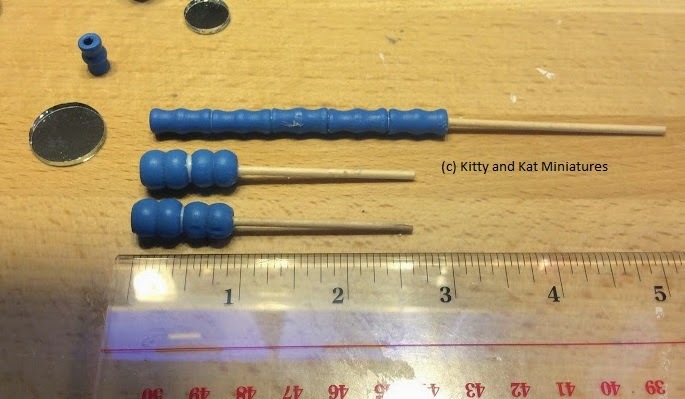 I fed the glued beads down the dowel, using 2 for the floor lamp. 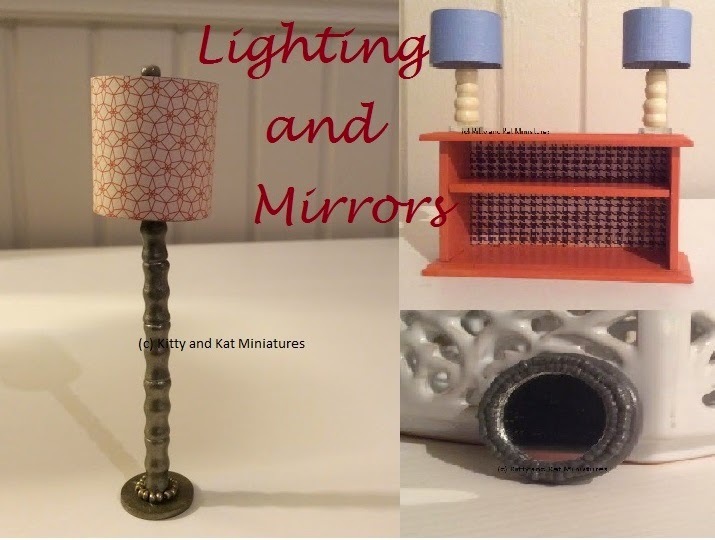 The floor lamp was 3 inches of beads and the table lamps were 1 inch of beads. The craft foam came in handy! I poked little holes in it and fed the dowel through. I could then spray paint and let them dry at my work bench. I was VERY disappointed a second time with the Krylon paint plus primer spray. There was no priming effect as it took 4 coats!!! I thought my first issue with it before was a one off but I was wrong. Rustoleum brand is so much better. 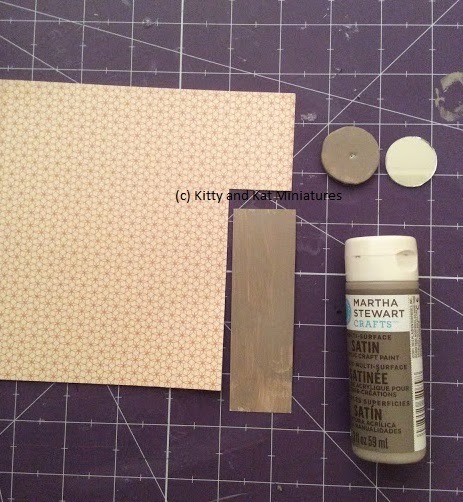 I painted the inside of the paper I used for the shade Martha Stewart 'Gray Wolf'for the floor lamp and metallic silver for the table lamps. The shade was a wee bit longer then 1 inch. To support and mount the shade to the "harp" aka the dowel, I then cut 4 foam circles, 2 were 1 inch (floor lamp) and 2 were just under 1 inch (table lamps). I glued the matching circles together and painted them the same as the inner shade. Poke a hole in the middle of the circle sandwich and feed them down the dowel. 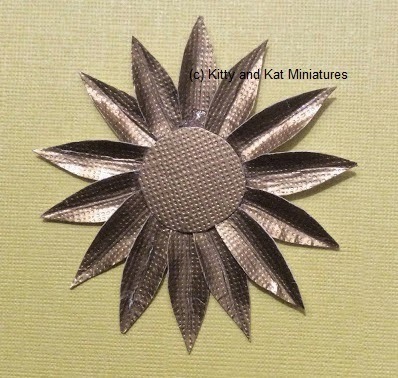 Apply glue to the edge of the circles, then wrap the paper around circles and voila! You have your shade secured! I then glue the lamps to the tiny mirrors. The table lamps have the mirrored surface while the floor lamp I sprayed the mirror to match the lamp. I also added seed beads to the base of the floor lamp for embellishment. 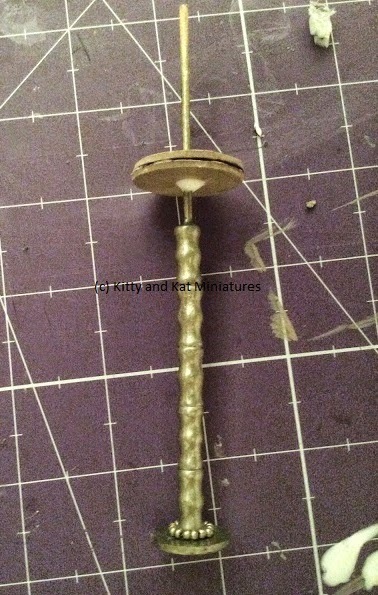 Each lamp was topped with a small bead for a finial (with the bead hole filled with glue). The mirror used a 1.5 inch wood circle and a 1 inch mirror. I painted over the entire mirror with a Plaid 'Medium Gray'. 2 coats were needed. Then I used Mod Podge in matte finish to seal it. Oh to sleep in a nice comfy bed. I'm totally avoiding making a bed for the dollhouse. I haven't found a tutorial that makes me happy. Somehow I have developed a psychological block on this bed thing. Gotta do it. 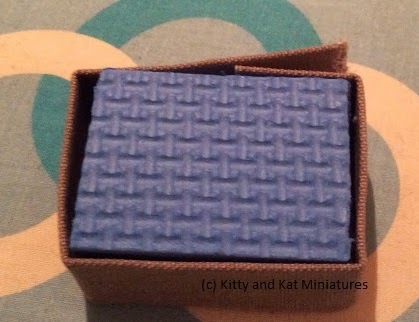 1inch Minis has a beautiful bed that I have been thinking about. And I have been sifting through Pintrest. I did a big shop at Michaels this week. Lots of wood, spindles, etc. were purchased with the intent of making a double or single bed. Ummmmmm. But, somehow the complex double bunk and desk combo I dreamed up on the slanted attic wall doesn't scare me. And on a totally unrelated note I am devastated Target is closing in Canada. It is my favourite place to shop. I did a dance of joy when they opened here. Kitty learned "Targeeee" very early and recognizes the bullseye. Where will I get dollhouse inspired? Sigh. I am a subscriber to both House and Home and Style At Home magazines. And I lust for many of the looks and stylized rooms. Alas, my house has been "house and home-d" thoroughly after 3 plus years, so I must now turn to the dollhouse to fulfill my design fantasies. Plus I have expensive taste, so this is a lot cheaper for everyone. 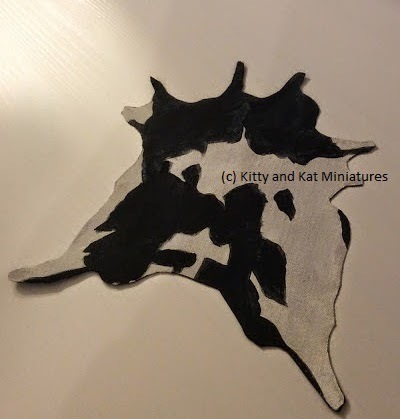 I really liked the look of a cowhide rug. It goes without saying, unless you had a 1:12 sized cow, the hide look might be a tad, well, hairy. The wheels turned, lubricated with coffee, and Kitty's afternoon nap let my mind wander. 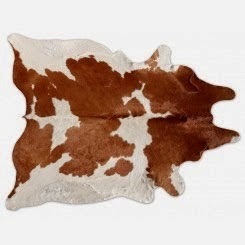 If you Google "cowhide rug" you get great images. I got this one from Pure Rugs. It's clear and not too splotchy of a pattern. I then stared at the picture on my iPad and let my pencil wander on the page. The rug I drew was 5 1/2 inches wide and 6 1/4 inches long. It works nicely with my sofa and coffee table. Press lightly and be careful because I found eraser marks tough to fully remove. I base coated the whole rug in the antique white craft paint. While it was still a bit wet I painted on the black portions free hand (I didn't pencil them in for fear of pencil marks). The white blended with the black and made for a more realistic look rather then a high contrast black and white. I let it dry for 30ish minutes. 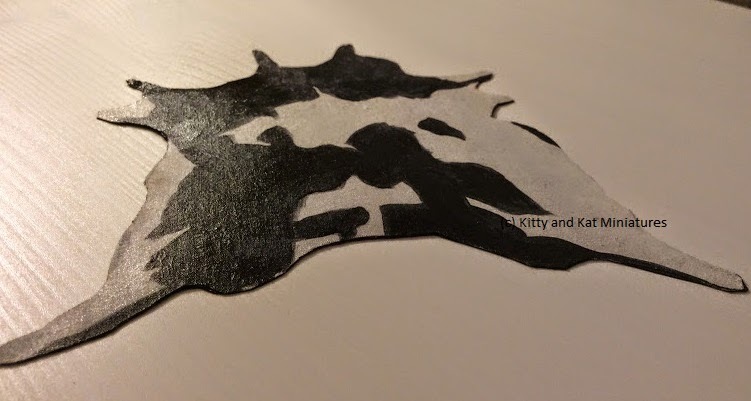 Then I peeled the backing paper off and adhered it to black card stock, which I then trimmed away the excess. It gave it a firm backing. Unintended awesomeness moment! The black showed through slightly as grey on the front of the rug. It made it look more realistic, because what cow isn't blotchy! protection and a sheen for appeal. I made sure it was really, really dry then pressed it overnight between heavy books. 2 weeks later it is still laying flat and looking awesome! 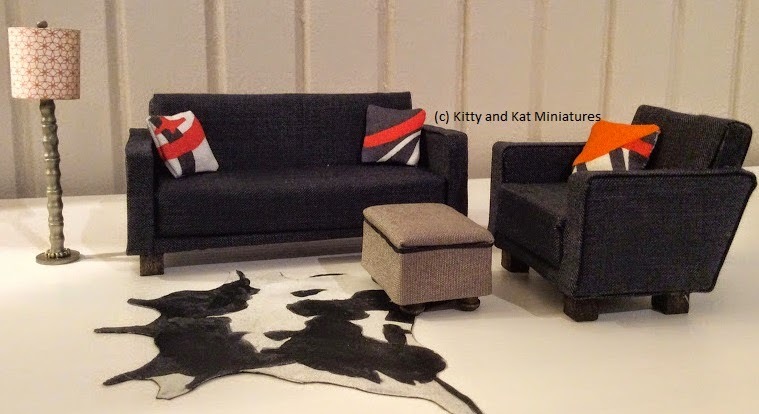 When I started redesigning the dollhouse from its original state I stumbled upon MitchyMooMiniatures fantastic tutorial on how to build a 1:12 scale couch. I started that couch in later winter 2014. It was completed January 2015. Oooops. 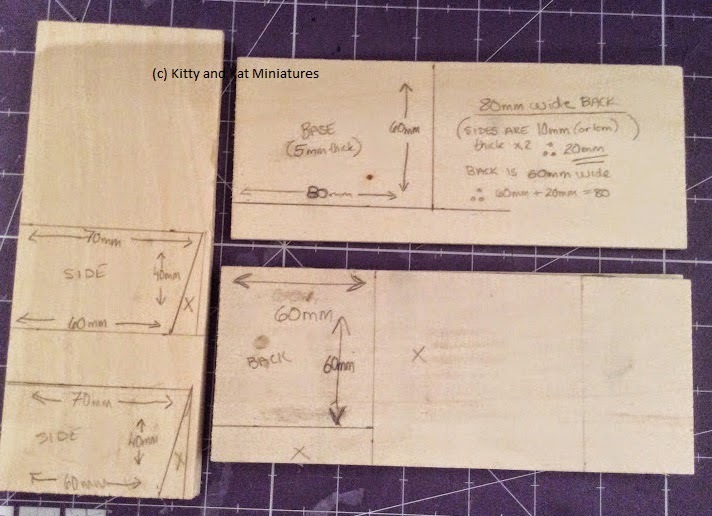 I decided to make mine from wood rather then MDF simply because the 2 pieces of 3/16 Elmers Wood Slats when glued together make the correct thickness (+/- a bit). 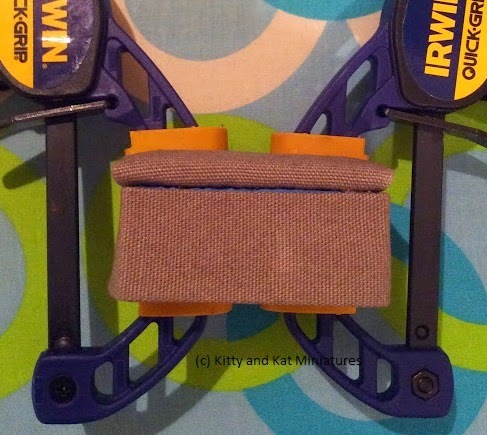 And I also decided to use my good friend, Quick Grip glue rather then double sided tape. 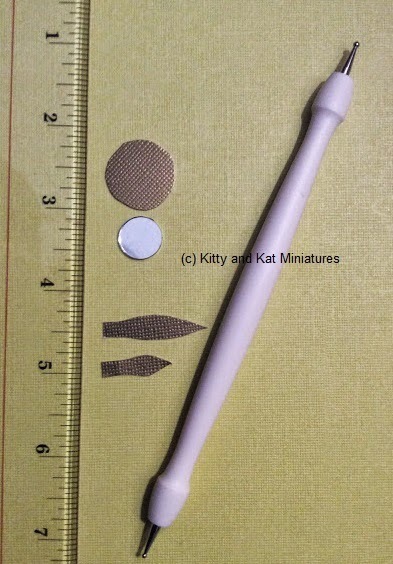 This was a bit of a double edged sword, sure it holds like no ones business, but if you mess up with that glue on fabric you either are spending tons of time fixing it or starting with fresh fabric (and swearing lots). 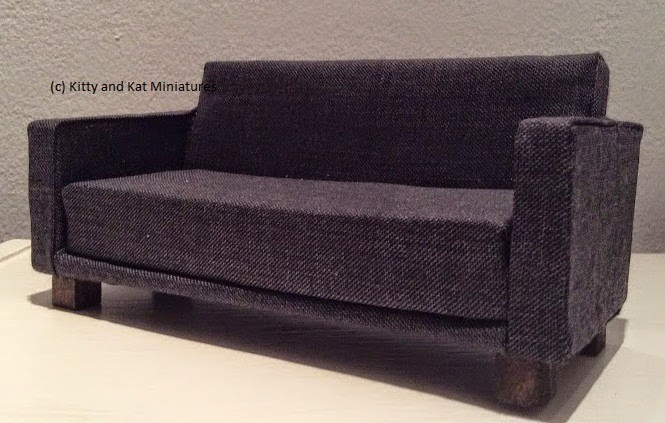 I used a dark grey suiting fabric (polyester) on the couch. It was fantastic to work with. 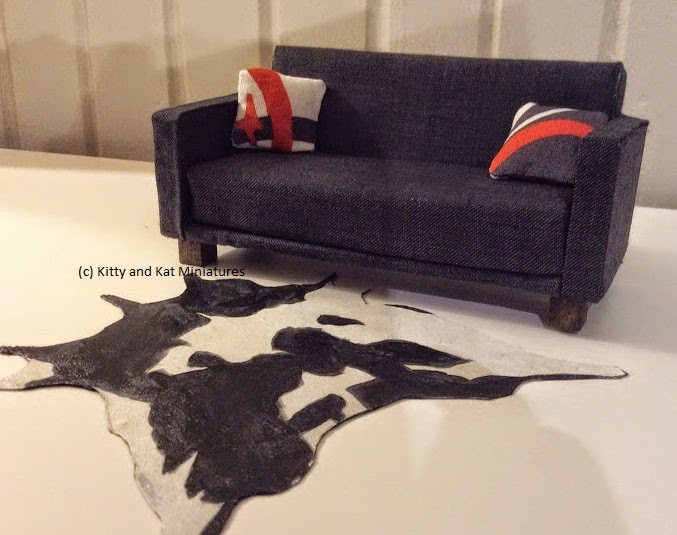 The MitchyMooMiniatures sofa tutorial Part 1 and Part 2 are your best bet, so please read and follow them before looking at my work. But I'm going to show you what I did and my little modifications. I started both the chair and the couch using the 2 pieces of wood slats that I adhered together. I'm of the go-big-or-go-home mindset so I busted out a tube of construction adhesive and used it as my glue. Excessive? Oh yeah. But I love using construction adhesive unnecessarily on projects. 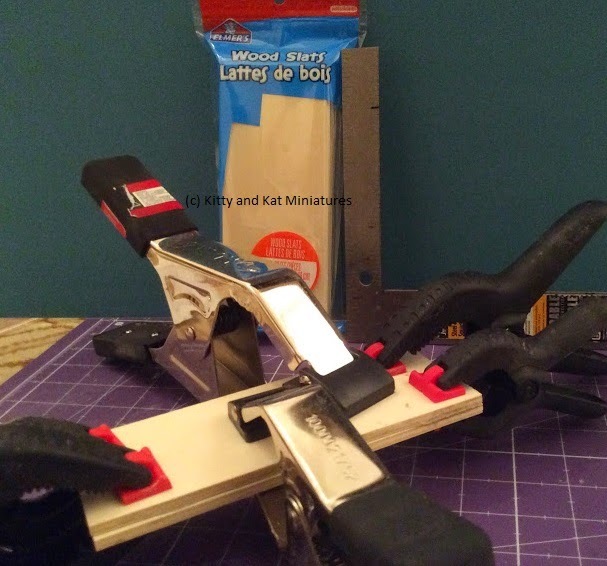 I let the adhesive set up over night and checked that the clamps hadn't misaligned the wood as it dried. 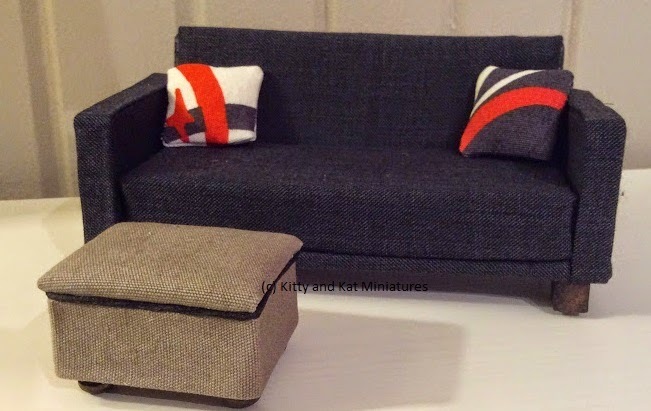 I used iron-on hemming tape to hem all my fabric edges on the main piece that wraps over the body of the couch. 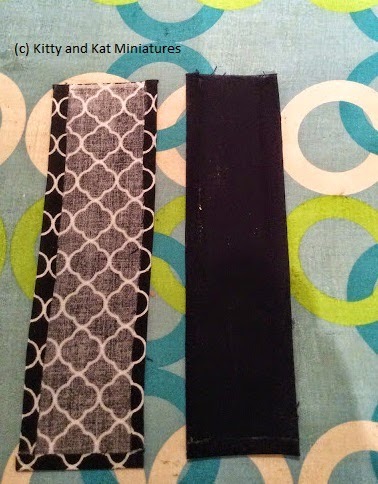 And I used the iron-on hemming tape on my fabric to make the strips for over the arms to cover the seams. 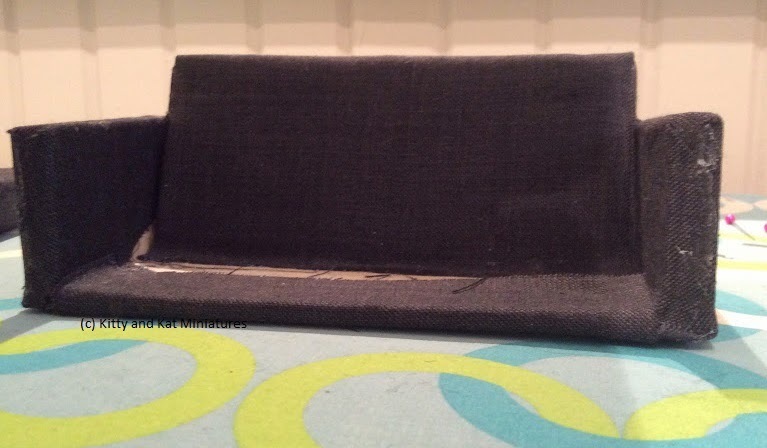 I didn't have anything to pad the back cushion so I used 2 pieces of dark grey felt. It worked just fine. The seat cushion was the suggested foam garden knee pad. Amazingly easy to cut. I used some of the foam again in the ottoman. Drum roll.......and the matching chair! 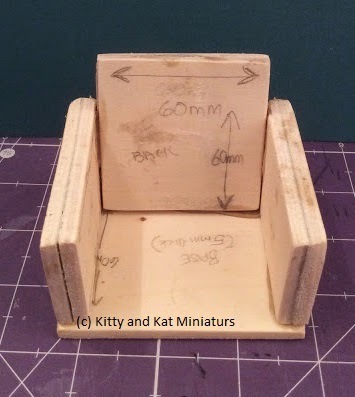 Here are my measurements for the matching chair to the couch. It's a generous seat, so maybe next time I might shave off 10cm from the seat base. And then I chopped it up with my hack saw in my vice grip. I didn't bother with the circular saw because I was worried the thin, cheap dry wood would splinter and crack. Again, I secured it all with construction adhesive! And did everything I did with the couch in terms of the iron-on hemming and gluing. I have a burning desire to modify the arms and give them a swoop or tuft the back cushion or do a skirt with piping. But I need to reel in those thoughts. Or I will have another sofa sitting around for close to a year. I made the pillows from my Ikea fabric squares. Let's be clear, upholstery material is not best used for tiny pillows. 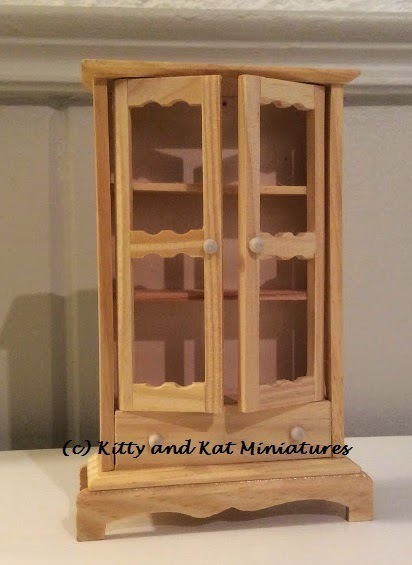 If you all hadn't guessed, I'm currently working on the living room of the dollhouse. And jumping around as thoughts and projects jump into my head. I have a back log of finished projects I need to post, but right now I'm working away at the hairpin legs for my end tables and the bookcase to flank my fireplace. And I think I might paint a picture tonight to see how I do in miniature......break out the rum and coke! I apologize for the rather sad ironing board cover that appears in my blog photos. It has seen more then its fair share of iron-on hemming for drapes and crafts. I swear its not dirty, its just burnt on hemming tape! 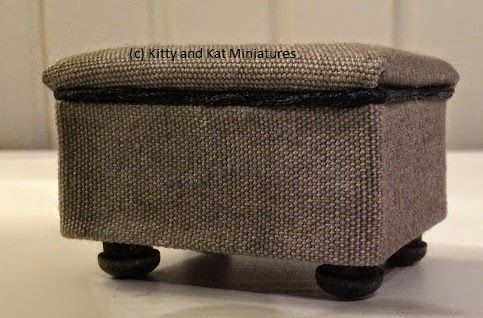 I couldn't think of anything witty with ottoman in it for the title of the post. Sorry. My inspiration for the ottoman came with a $1 breakfast at Ikea. Kitty, myself and my husband enjoyed our cheap treat and of course had to wander through Ikea. I did exercise some shopping restraint. But in the fabric section these large circular bundles of square cloth pieces caught my eye, along with the $3.99 (I think) price. There were at least 40 pieces of material with different bundles having different colour themes. Brought home a bundle and the wheels started turning. I took Kris' measurements of 2 1/8 by 1 5/8 for the general dimensions. The foam itself was 3/4 of an inch thick. Close enough for me! I wrapped the bottom of the foam with fabric. I always use Quick Grip glue, but be forewarned if you make it gloppy, it will bleed through the fabric. I then took a strip of the fabric, the length being the entire circumference of the foam block, and cut it so it was 3/4 inch wide PLUS room for a hem. Then I used the iron-on hemming to make the strip neat and tidy. 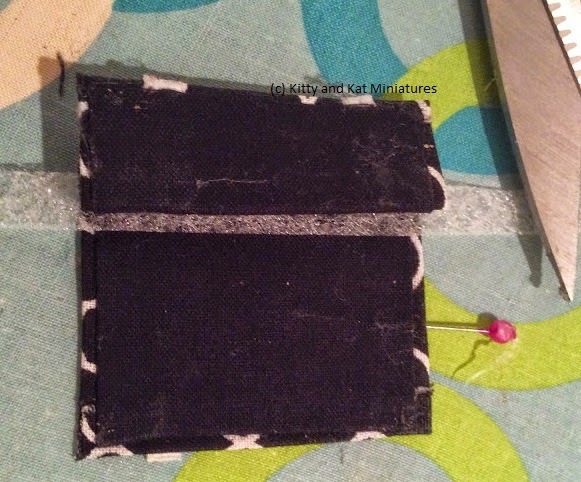 Advice: Gently pinch the fabric at each 4 corners, then go back to press each corner with the iron. Makes for sharp corners! 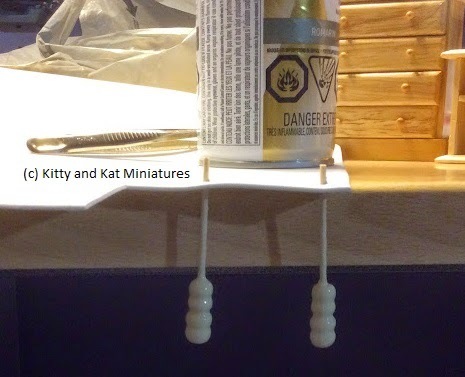 And clamp the 2 ends to the foam to dry. 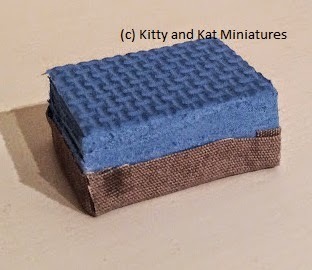 I then took the cardboard I had cut for the top of the ottaman and wrapped it in felt. I didn't have batting sheets. Then, I wrapped the whole top with the fabric. 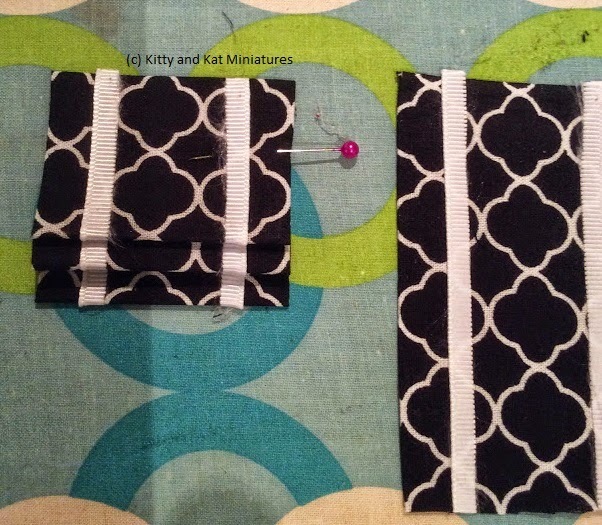 Unlike Kris' tutorial I didn't make the top piece square and repeat the fabric band part around it. I simply folded the material over and glued. Here is the beast glued together and clamped. Doing it by hand is a big pain and I always find something slips off center just enough that I get angry. I couldn't get inspired to follow Kris' instructions for piping. It just looked like too much work at 10 pm for me to try. SO I took some embroidery floss, used my Aleene's glue on my fingers and smeared the floss with glue, then gave it a few twists. I gave it a minute to tack up, then put it in the seam between the top and the base. Gap problem solved! I stained and glued on 4 wood feet to finish the look. And here is my finished product! The height works better with my couch. All in, it took less then 1 hour while I did loads of laundry. 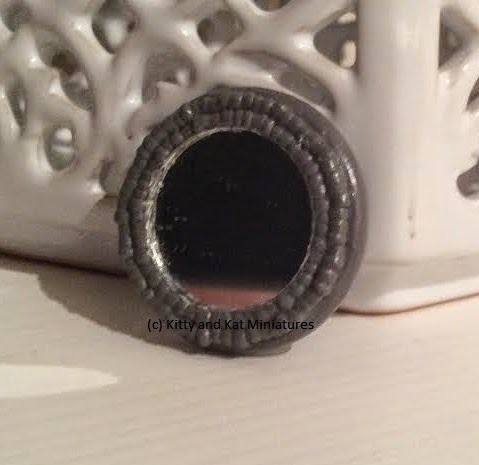 And please look through Kris at 1 Inch Mini's tutorial before following mine. She has all the details and knowledge, I just modified things to suit my needs. I decided the attic needed blinds. Given the slant of the roof line in the attic, I thought drapes might be visually too much and take up precious space. Enter, roman blinds (or roman shades). I went to visit the queen, Martha Stewart, for inspiration. And by inspiration, actually recall what a proper roman blind looked like. I couldn't find any tutorials online so here is my first attempt at it in 1:12 (ish) scale. I used the iPad as my camera so the pictures are hit and miss. First, I did a quick measurement of the frame and cut my fabric to allow for a wee hem and to be long enough for 2 blinds. If you're burning your fingers with an iron, do it once! I cut the black backing fabric slightly more narrow and hemmed it too. No chance it will peak over the front edge. 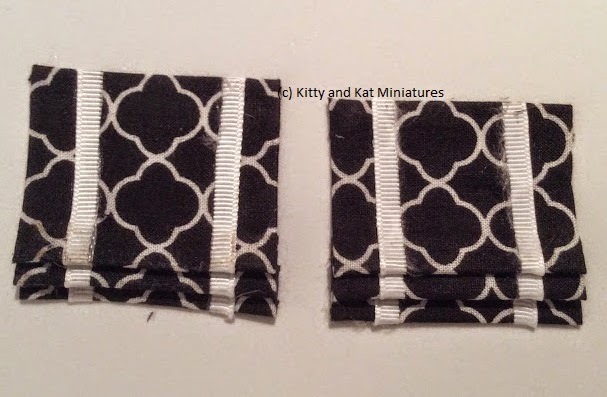 I then used the same iron-on hemming to attach the black backing fabric to the back of the quatrefoil fabric. Note the pin in the photo. The area above the pin is where the drape will be adhered to the frame. 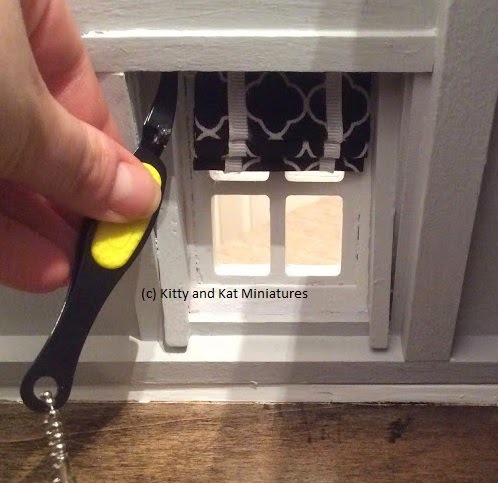 This is important as you need to ensure you have enough length when you cut the strip for 2 blinds. The blind is now cut to the full length of the window plus the additional allowance for the adhesion to the frame. Dry fit at this point to ensure everything is good! Then use the iron-on hemming to seal your last raw edge. The pin remains to keep that frame allowance in my view so I don't get carried away and forget. I then used tiny strips of the iron-on hemming on the back of the blind to secure each pleat. Its a delicate balance with your iron, you have to press long and hard since its a thick pleat, so don't burn your fabric! I used Aleene's No Fray fabric adhesive on the ribbon. I painted it on with a brush. I found the ribbon, when cut, would fray too much for my liking. I adhered the blinds to the house using 3M Command Adhesive strips. Who knows when I might want to swap them out? There you have it! 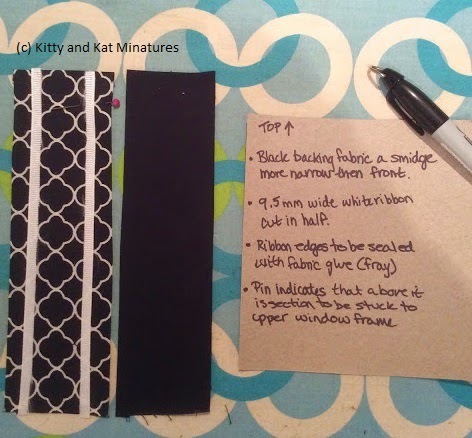 Two Roman blinds cut from a long strip of fabric.